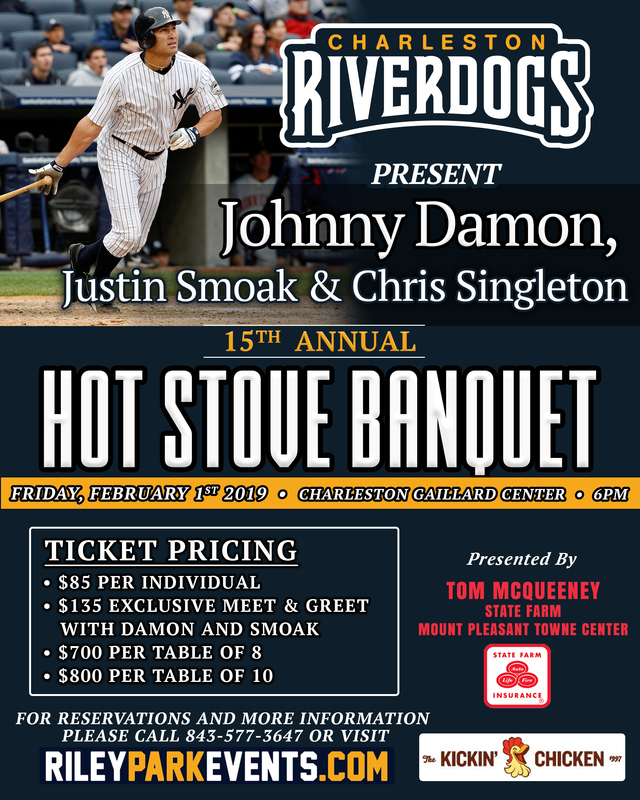 Join us for the 15th Annual Hot Stove Banquet featuring former NY Yankees great and 2x World Series Champion, Johnny Damon! Featured guests will include Justin Smoak, of the Toronto BlueJays, and Chris Singleton, a Charleston native. Emceeing the event will be RiverDogs President Emeritus, Mike Veeck. The event includes photo and autograph opportunities, silent auction, dinner and a Q&A session with Johnny Damon. Benefiting: The MUSC Shawn Jenkins Children’s Hospital & the College of Charleston, Citadel and Charleston Southern University Baseball Scholarship Funds. Meet & Greet: A private Meet & Greet with Johnny Damon and Justin Smoak will be held prior to the Banquet on February 1st, 4:30-5:30pm. VIP tickets provide access to the Meet & Greet and the Banquet. Autographs: First-come, first-served basis starting at 6pm. Autographs are not guaranteed. Fans are not permitted to “save spots” in line for others. One autograph per person. 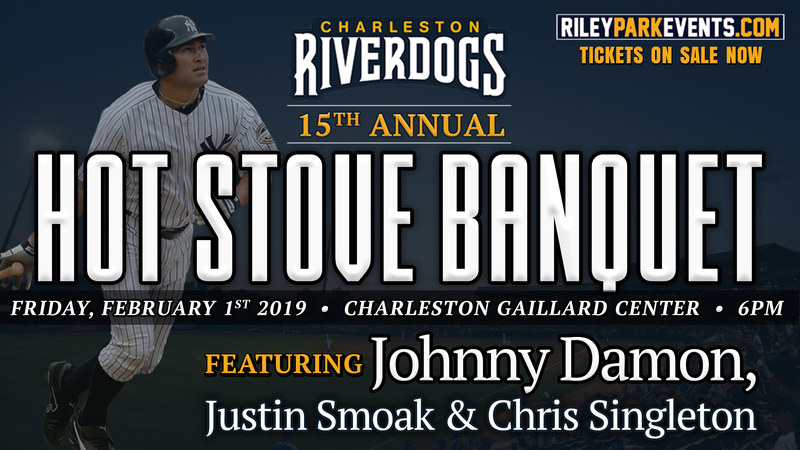 Contact Lisa at ldingman@riverdogs.com to reserve a table of 8 or 10 or click the “Order Form” button above and return to the Charleston RiverDogs. Past Guests Include: Andruw Jones, Ryan Klesko, Tom Glavine, Ryne Sandberg, Goose Gossage, Brett Gardner, Javy Lopez, Phil Niekro, Wade Boggs, John Smoltz, Bobby Cox, Dale Murphy, Gaylord Perry, Jeff Francoeur, Tommy John, Jim Bouton & Bobby Richardson.